1 of 3 Heat oven to 350 degrees F. Line 12 cups in standard-size muffin pan with cupcake liners. Whisk together flour, baking powder, cardamom and salt in a bowl. 2 of 3 Beat butter and sugar in large bowl until light colored and smooth, 2 minutes. Add eggs, one at a time, along with extract, beating well after each egg, On low speed, add flour mixture. Stir in nuts. Divide batter among liners, a rounded 1/4 cup each. 3 of 3 Bake in 350 degree F oven 25 minutes or until toothpick inserted into centers comes out clean. Let cupcakes cool in pan on wire rack for 5 minutes. Remove cupcakes from pan to wire rack; let cool completely. 1 of 1 Beat together butter, sugar, walnut extract and milk in medium-size bowl until smooth. Spread 2 tablespoons over each cupcake. 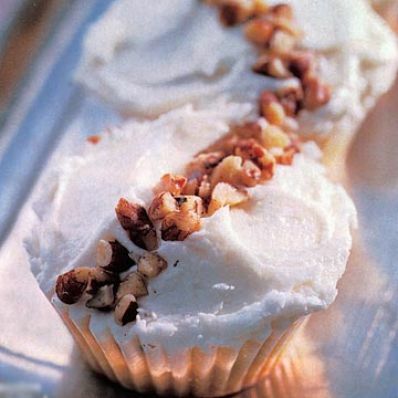 Decorate tops with chopped walnuts. Cupcakes can be refrigerated for up to 1 week.